Hi everyone I hope that you are well and happy. Welcome to my little bit of blogland its been a bit of a crazy time here recently but settling quite nicely now and I have even finally moved into my craft room affectionately known as the craft cavern. Its challenge time over at Stamping with the Dragon and the theme this week is Autumn Colours. We have had some gorgeous digis to work with again for this challenge so here is what I have created and I hope that you like it. 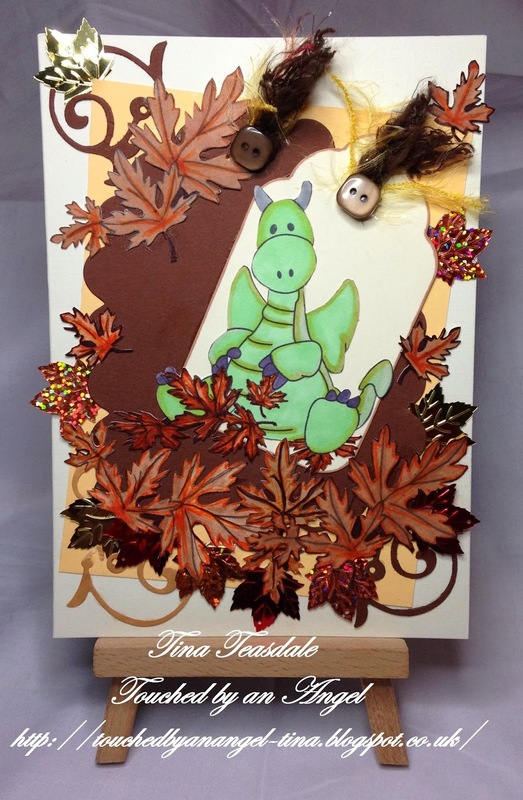 Base: 5x7 textured card blank from Papermania, layerd with a clotted cream coloured card. Embellishing: die cut swirls, red, gold and bronze foil leaves, fibres and buttons from my stash. Lots and lots of fun stuff on a daily basis over in the Facebook group from fun challenges to try something new and always crafty chat and laughter! Pop along and enter the challenge for your chance to win the fab prize that we have on offer again this fortnight. This is gorgeous Tina, glad to hear you have settled into your crafty craven. This is super - love those leaves. Great card, love the image and the leaves. Lovely colours. This is absolutely gorgeous Tina. I love all the leaves scattered around the card front. And of course I love the little dragon.